Lately I have been obsessed with the idea of making my own spicy sushi maki rolls. Spicy tuna roll is my favourite roll to eat at a sushi restaurant, and any roll that has spicy sauce in it is my second favourite. I have previous experience making California rolls, and I am really excited about adding spicy sauce to the mix. 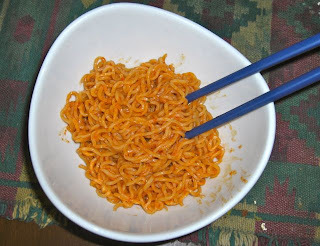 I was not 100% sure what the spicy in Spicy sauce was, but I did some Googling to find a recipe and many sites suggested something called Sriracha Sauce mixed with mayo. I went searching in Midland and Food Basics had a bottle of the stuff! I didn't know of Sriracha Sauce before yesterday, but now I am completely obsessed with it! I'm not waiting until I make my spicy sushi rolls, I am currently adding it to everything I consume. Last night we added it to a pack of drained Mr. Noodles and it was glorious! I couldn't help but have more Sriracha soaked Mr. Noodles again for lunch today. The sauce adds an amazing flavour with the perfect amount of spice. I was home alone for dinner tonight, and when that happens I often find myself eating the weirdest assortment of foods. When I lived alone I was able to make my own meals regularly (and be really good at it), but now if John's away I'm likely to eat things like Mr Noodles for dinner (even if I had it for lunch). My eclectic meal from this evening was pretty much anything that could be a vehicle for the Sriracha sauce. I had half a can of baked beans in tomato sauce (drenched in Sriracha sauce), 2 egg rolls (that I dipped in Sriracha sauce), and 3 hash browns (which I also dipped in Sriracha sauce). Super yum! I kind of want to bring the bottle with me to Easter dinner tomorrow and put it on...everything! I hope I have some sauce left for when I get around to actually making maki rolls!! Have you tried Sriracha Sauce? What do you think? Also check out this comic from The Oatmeal that also expresses a love for Sriracha sauce!